FOOD MINERAL: What is iodate? Natural sources of iodine may not satisfy its requirement by the body as iodine from these sources may not be in bioavailable form and also the concentration of iodine may be less. Adequate intake of iodine can be achieved by consumption of iodized salt. Iodization of salt is done by addition of iodate to salt samples due to its good stability and bioavailability. Natural waters, particularly marine waters contain iodine chiefly in the forms of iodide and iodate. Organic iodine compounds in biological samples have been identified by classical natural products chemical techniques following their isolation, and by modem spectroscopic methods. 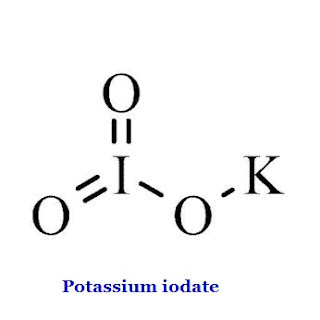 Iodine is normally introduced, or supplemented, as the iodide or iodate of potassium, calcium or sodium. Potassium iodate (KIO3) is more stable in unrefined salt than the iodide, removing the need for extra stabilisers or carrier agents. It is also more stable in unfavourable atmospheric conditions such as in high humidity. This is the form that is currently used in Australia and New Zealand for the iodisation of salt.